Right to the name, “The soul of Vietnamese Village” will take you back to the good old days of Vietnam’s countryside. 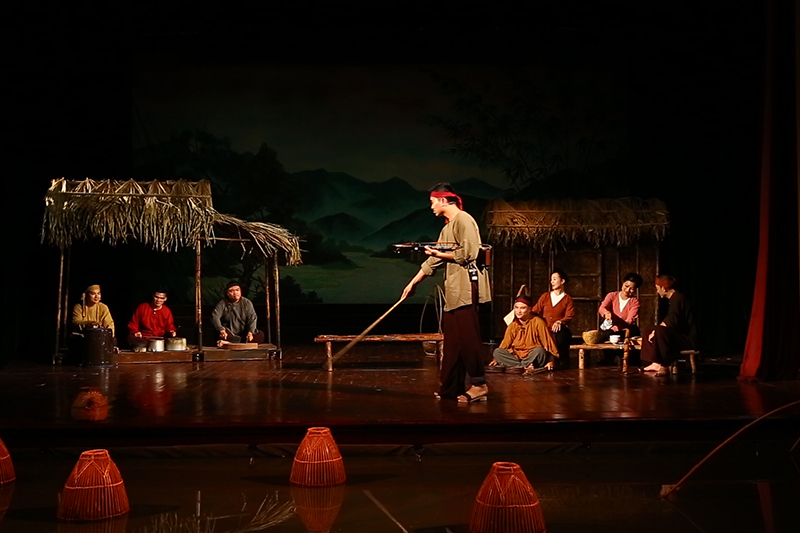 The show gives the audience a chance to immerse in folk music space, admire artists telling the story, and get a glimpse of daily life with various traditional customs of Vietnamese people in the Northern Delta villages. By the great efforts of a group of Vietnamese artists, journalists and folk music researchers, “Soul of Vietnamese Village” was born with the aim of introducing the beauty of traditional Vietnamese culture to visitors at home and abroad. 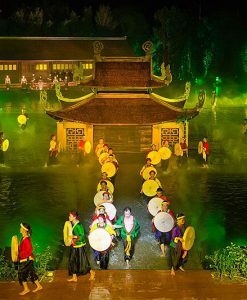 The show is the combination of all 4 genres of Vietnamese folk music that are also well-known for being UNESCO Intangible Cultural Heritages. 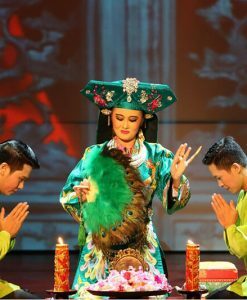 They are “ceremonial singing” (ca trù), “invocation singing which accompanies trance ritual” (chầu văn), “royal court music” (nhã nhạc cung đình), and “love folk duets” (quan họ). 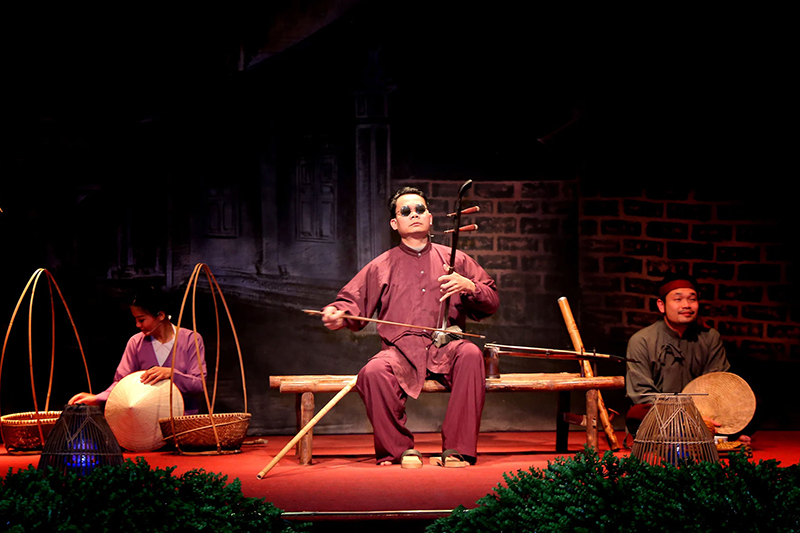 “The Soul of Vietnamese Village” entices audiences with folk music created by a wide range of Vietnam’s traditional musical instruments such as plucked lute (đàn đáy), monochord (đàn bầu), 2-string zither (đàn nhị), 16-string zither (đàn thập lục), 36-string zither (đàn tam thập lục), flute and drum, and more than twenty other instruments. Most of them are made from bamboo. 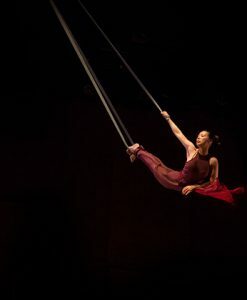 Additionally, first-timers travel to Vietnam and join the show may be surprised at numerous houseware are skillfully used in the show as musical instruments. In the old days, however, Vietnamese people usually used common goods such as kitchenware and brooms to make different lush sounds to color their hard life. 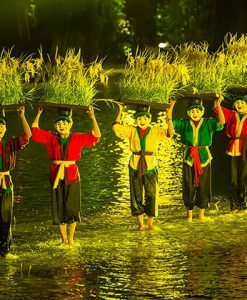 “The Soul of Vietnamese Village” is performed in seven parts describing the outstanding features of the landscape, daily activities, culture, and beliefs of rural locals in Northern Vietnam. This first part shows the daily activities of villagers in the early of the morning. The man is fluting while looking at nowhere but far away, like his obscure future. When the sun still sleeps, in the fading light, the scene appears with rural people wake up early and prepare for a new long day. The next scene takes you to see a man enjoy a simple breakfast with his wife – a bowl of tea happily together. His wife is cooling him by the hand holding fan in the cuddle way and wishing a warm and happy life ever after. The second part of “Soul of Vietnamese Village” give the audience a closer look to the bustling and buzzing atmosphere of the markets in the Vietnamese countryside. All the sounds are created from musical instruments from the pot, bucket, chopping board, knife, bowl, chopstick to traditional Vietnamese instruments such as monochord and drum which makes the busy panoramic of traditional Vietnamese markets more alive. Continuing the show, the scene moves to a field being in harvest season. The audience will have a chance to feel the busy atmosphere of people works on the field. Then many people gather for taking a rest. Jokes and interesting stories together with laughing of farmers create funny moments. Let’s admire in the daily activities of villagers during the time of harvest season. 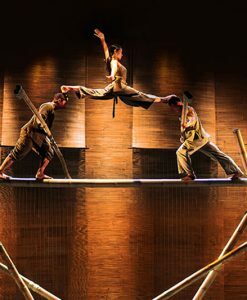 This act opens with a scene of the hot weather in Vietnam. With the image of the mother keeps holding the fan to cool her child who is sleeping in a crib, the audience can deeply feel and understand the love of a mother. “Soul of Vietnamese Village” continues with a scene of making traditional handicraft products of rural people. Each period of the process is arranged to specific groups of people to get the most effective results. The sound of musical instruments and stage effects contribute to make this scene more alive and beautiful. 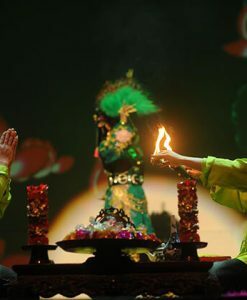 This act gives the audience the poetry image of a beautiful woman sitting next to a huge jar in the “yếm đào” – the traditional brassiere of Vietnamese women – to washing her hair and body. On the background of “Ca trù” folk music and dark light in the night, the sound and light effects will give you a peaceful feeling. 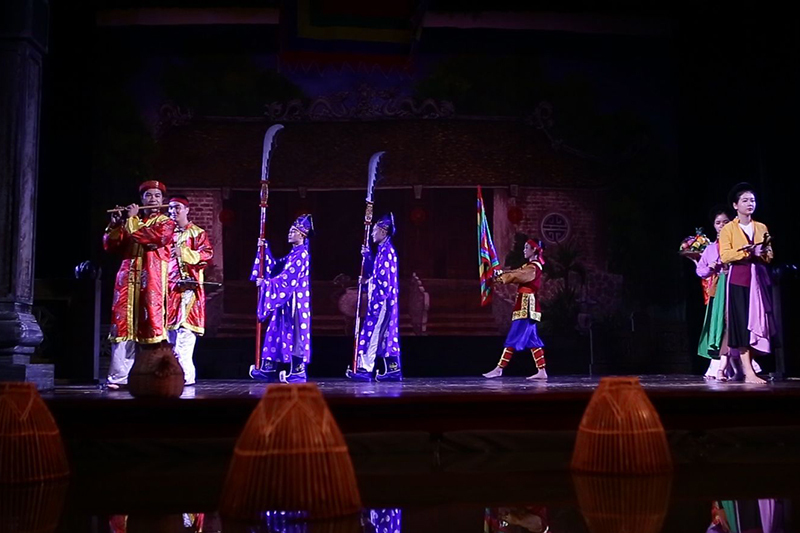 In this act, the audience will enjoy one of the Vietnamese traditional music which is “Hát ống”. You will see woman and man are using the bamboo tubes as the musical instruments and singing along, reveal the flirting activities of young people in the village when they are in the age of marriage. You also have a chance to admire the vibrant and chaotic scenery of village festivals with many folk games and folk songs. 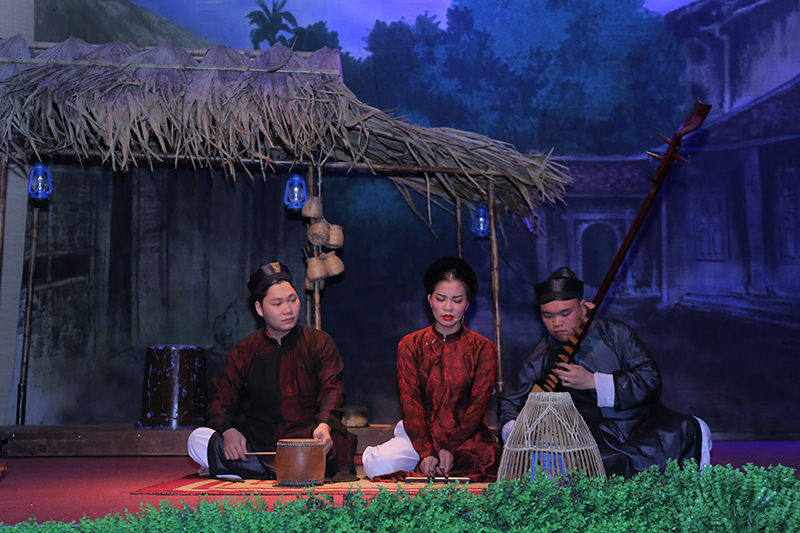 Songwriter Mai Tuyet Hoa, Director of the Centre for Research, Conservation, and Development of Vietnam Culture – the show’s producer indicate the purpose of “Soul of Vietnamese Village” is to promote folk music to Vietnamese people and foreigners. 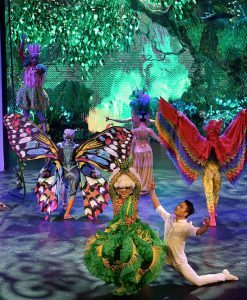 In the show, the music combines together with stage décor and sound effects will create a featured space of rural countryside in Northern Vietnam. Besides, modern lighting techniques, self-painted backdrops, sound effects of birds, insects, and water will lure you away, move visitors back to the happy childhood in loving hometowns. 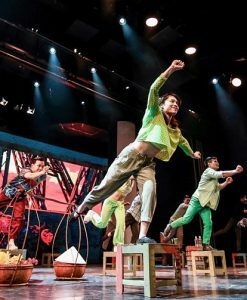 Monochord artist Pham Trang of the Hanoi Academy of Theatre and Cinema share her exciting feelings after performing the “Soul of Vietnamese Village’. She said this also a great chance for her to learn stage skills from fellow artists.